Which one’s best for you – Retirement funds, Tax Free investments, Endowments or Direct? In our first article on this topic, we discussed the differences between the four different investment vehicles. The main take away was that you could put the same unit trust (mutual fund) in all of them, but the tax treatment of them was different. Now that you understand that, the question comes as to which is best for you? Well, not knowing your personal circumstances, I can’t say. But let me give you the information so you can make a better choice. The theory is always great. The challenge comes in the difference between theoretical behaviour and actual behaviour. And this is a field of study called behavioural economics. I love behavioural economics because in my wealth management business, I’ve seen so many times that theory and behaviour are very far apart. So this is where being mindful about your money behaviour is hugely important. 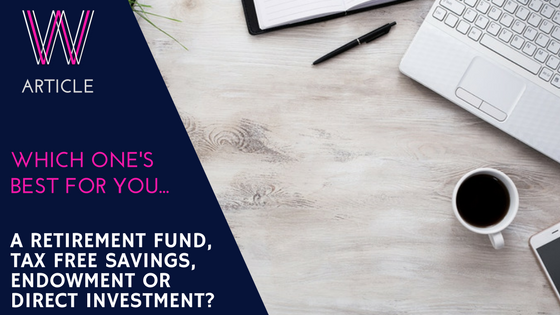 Retirement funds – if you are self employed, or adding extra money into your own private RA, then you need to be honest as to what’s happening to the tax money. If you’re using the retirement contributions to lower the tax paid, but not taking that amount that should have been paid to tax and putting it in an investment account, then rather put the money into the TFSA or a discretionary fund. If you don’t get the benefit of the money going into the investment tax free, then you’re going to pay tax twice on that investment – once when the money goes in, and again when the money goes out. And if you’re spending the money you get back in tax and not putting it into an investment account, then you’re going to pay tax twice. Endowments and Retirement funds – if you think you’re going to put your hand in the cookie jar of a TFSA or discretionary fund, then rather lock it up in an Endowment or RA. Even use a notice account – less interest is better than no savings at all. The barriers to exit make it a challenge. Paying tax – for many people, it’s better to pay tax now whilst you’re earning and it just squeezes out spending rather than in retirement.